The Ortovox Patroller was discontinued in 2013. Summary: The Ortovox Patroller is a three-antenna dual-mode (analog and digital) transceiver that evolved from the Ortovox X1. In my testing, the unit did not suffer from the sluggish and jumpy direction indicator problems of the Ortovox X1 and Ortovox D3, but its direction indicator is limited (by design) to about 15 meters. 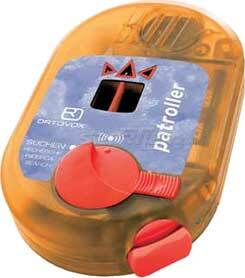 To add to the naming confusion, Ortovox also sold a transceiver named the Patroller Digital. Searching: As with the Ortovox X1, the Patroller begins in analog mode using a single antenna. The distance indicator then appears when the transceiver is approximately 40 m from the transmitter. The direction indicator lights appear when the distance is approximately 15 m. The directional indicator then does and excellent job of guiding you to the transmitter. This approach, using a single antenna until you are within 15 meters and then displaying a directional indicator, is by design. Unfortunately, unless you are skilled with an analog transceiver, the lack of a direction indicator until you are 15 meters from the victim is simply too limiting. When the Patroller is within two meters of the victim (2.1 meters, actually), the direction indicator lights turn off (a good thing). As with the Ortovox D3 (and unlike all other three-antenna transceivers), the Patroller struggled to resolve spikes. In my testing, the Patroller and D3 performed a little better than two antenna transceivers at resolving spikes, but a careful fine search repeatedly centered the transceiver over the spikes rather than the victim. Although the Patroller's analog range is extremely long, the fact that the direction indicator does not appear until 15 meters (versus approximately 50 meters for newer transceivers), and the fact that even with three-antennas it does not accurately resolve spikes, makes the Patroller a less than optimum choice for most people. However, if you are skilled with an analog beacon, the long reception range is very impressive . Controls: The controls on the Patroller are simple and easy to use.